This page will be used to highlight various Vision builders from time to time. It is important to realize that these are planes being built by real people just like you. Thanks is given to the people presented on this page who have agreed to share their thoughts and projects. My wife is Adele and we and our West Highland Terrier live on a four acre parcel of land just outside of Cochrane Alberta, Canada. We have been living here since 1990 when we had our house built here. Acreage living used to be quite busy when we had horses, but now things are very easy to manage around here with only the dog. I have 3 children from a previous marriage living in Calgary just a short drive from us, a son Bryant, daughters Chelsea and Ashley. They are aged 29, 26 and 24 years of age. I am a communications technician and have been working for the major Telco in our area for 27 years. A very rewarding occupation, which has seen extreme changes in equipment over my years with the company “TELUS”. I am now about 24 moths from retiring if I choose to do so and thus have many options ahead on the horizon. I come from a family that has had some background in aviation. My uncle spent a full military career flying for the Canadian air force. My father began flying in WW2 and flew PBY Catalina and Sunderland Shorts on submarine patrol for Canada based out of Pool England. He then went on to fly briefly for BOAC (England) and then Queen Charlotte Airlines (British Columbia) after the war. In about 1955 we moved to Calgary Alberta and he then completed a 27 year flying career with Shell Oil Canada. That was many years of bush flying and then right up to Citations as the requirements changed over the years. Most oil companies only have a shell of what was once major fleets years earlier. My father is 85 years old living with my mom on one of the Gulf Islands of British Columbia. and are watching my aircraft build with interest. I hold a commercial license with night, multi engine, and instrument, ratings. I have about 1200 hours time and most of it being multi engine in a twin Apache that I previously shared. Well plans #44 are sitting on my work bench. Plans purchased in 1998 started a great voyage into aircraft building of which I had no personal experience previously. What a great choice I made. Today I am just as excited to get into the shop to work for a spell as I was when I first carved and bent my first piece of foam. I chose this aircraft and figured that it would be a retirement project. Nope, that changed within a couple of weeks of receiving the plans. I decided it would be a great hobby project to put my efforts into as I worked towards retirement instead. The golf clubs have been used once since then. For me a hobby it is and that suits me the best. You can turn bowls make jewellery, build cabinets, but for me it is build an airplane that you will actually fly. I feel this scratch built plane gives me the best option to be creative and make a piece of art that is all my doing. This is much more work than a kit but the rewards at the end are unbelievable. I joined our local RAA (Recreational Aircraft Association), got to know the regular long term members and gleaned from them all the info I needed to become a builder. They have been invaluable over the years and now I help return the favour to others as I sit as president of our local Calgary chapter of RAA. I have seen many of our club members celebrate their first flights over the years and soon it will be my turn and boy am I getting excited to see that day. Please see my web page at http://users.xplornet.com/~vision/tailfeathers.html for current status. Also please note that I believe in keeping an accurate log record of all your building hours as you go. This is the only way to see that you are making average progress over the years even if it is just weekends you have time to work on it. You can see on my web page that my project will not take much more time than many of the kits that you see completed. 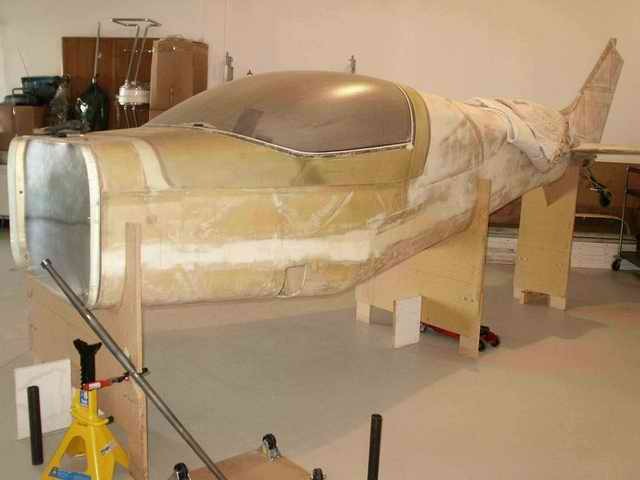 I am very happy to have chosen composites, I believe the strength of the finished airframe is far superior to aluminum and should last as long. Easy to repair and easy to form complex compound curves. Surface will withstand minor hail storms easily if you have to park outside. No special tool inventory required, a small supply of regular home &garage shop tools are most of what is needed. Smart tool digital level, rotary Zip tool, laser level, bare hack saw blades and basic medium weight poly construction plastic for preparing wet cloth for applying to aircraft. Copyright Pro-Composites, Inc. All Rights Reserved.